After a six month trial run, the Green Trailer has proved its worth and Barloworld Logistics is now planning to convert the rest of the fleet on the same route running the same contract. When FleetWatch Reported on the launch of Barloworld Logistics’ Green Trailer project last year (see FleetWatch, July 2010 edition), we promised our readers to get back to them with results once the test run was completed. A promise we make is a promise we keep so here we go , and it’s all good news.When FleetWatch reported on the launch of Barloworld Logistics’ Green Trailer project last year (see FleetWatch, July 2010 edition), we promised our readers to get back to them with results once the test run was completed. A promise we make is a promise we keep so here we go , and it’s all good news. Just to recap, when Barloworld Logistics launched the project last year, they had put in place a simple yet effective measure to do something real to reduce costs, increase efficiency and positively impact on their own carbon footprint. The Green Trailer is an interlink tautliner trailer combination which, through some practical innovation structured mainly around improving aerodynamics, was intended to achieve significant reductions in the amount of fuel used. 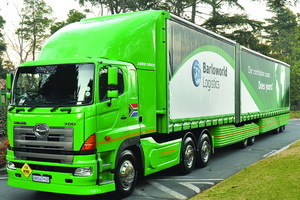 Francois van Rensburg, divisional director at Barloworld Logistics, said at the time that all changes made to the green trailer were within the bounds of current legislation. to provide a sustainable road transportation solution for our clients that is both practical and which complies with legislation,’ he added. After the launch, the rig was put to work running on a dedicated route for a specially selected customer for six months in order to confirm the quantifiable benefits of the trailer. The research run was conducted on the N3 between Johannesburg and Durban. The vehicles on this route do a round trip of 1 160 km on a dedicated route every 24 hours and 98% of the route is on the N3 and N2. The initial simulations based on the green trailer research indicated a 35% reduction in the total drag when travelling at a constant speed between 70 and 80 km/h giving an expected reduction in fuel consumption of between 6% and 8%. However, the actual benefits far outweighed expectations. The rig travelled 100 000kms in the six month period and saved 10,6% in fuel when compared to the rest of the fleet running the same route, under the same weather conditions and with the same payload. According to Van Rensburg, this equates to an actual cost saving of R8 500 per month just on fuel – and just on one rig! The total wind drag reduction from the Green Trailer conversion also exceeded expectations coming in at up to 43%. The smile on the face of Francois van Rensburg, divisional director at Barloworld Logistics, says it all. Success beyond expectations. The other major benefit of the significant reduction in fuel use is, of course, a reduction in carbon emissions. “The 10.6% fuel saving amounted to a massive reduction of 13.77 tons of CO2 emissions during the test period,’ says Van Rensburg. Commenting on the success of the project, Van Rensburg says Barloworld Logistics is extremely proud of having demonstrated conclusively that significant savings , and environmental benefits – can be achieved with existing transport fleets and that innovation to drive these benefits should come from the industry itself. Following this successful trial, the company is now planning to convert the rest of the fleet on the same route running the same contract. Interesting is that Van Rensburg puts the payback period on investment in the conversion at around 17 months. Road transport remains one of the main contributors to South African companies’ supply chain carbon footprint and going the route Barloworld Logistics has gone benefits not only the environment but also the pocket of the operator , both in the short and long term. This is proof that adopting environmentally responsible paths benefits everyone, everywhere. I repeat what I put to Van Rensburg last year that taking such an investment decision is, however, easier for a bigger corporate than for a cash-strapped small to medium sized operator. What is his answer to getting them to follow this example? “Government needs to come to the party with some form of incentive to get operators to buy into the concept. Operators also need to be educated in doing the sums and understanding lifecycle costs,’ he said at the time. These two points remain valid but in the meantime, we lift our hats to Barloworld Logistics for embarking on this project which, if emulated by others, should go a long way to reducing the carbon footprint of the South African trucking industry. Well done guys!